All plans include your own name server. Unlike most providers, adns.us owns & operates its entire infrastructure. All of the adns.us data centers are staffed 24/7 on-site by our Heroic Support engineers. This allows us to provide an unmatched level of security and reliability by responding to issues directly. At adns.us, 24/7 Heroic Support services are available with all dedicated server plans. Our Heroic Support services include 24 hour pro-active server level monitoring, pro-active service restoration and the peace of mind of a 100% network uptime guarantee. Our comprehensive group of server upgrades enable our clients to design a complete hosting solution. 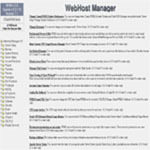 WebHostManager - Your Control Panel Included! The WebHostManager Software allows you to create, edit and remove hosting accounts in real-time, view server status, upgrade/downgrade accounts, view and limit bandwidth usage, password modification, full control over your DNS zones, install/uninstall FrontPage extensions and much more! Live demo CPanel - Client's Control Panel Included! Your client's control panel, included with every account you create! Read Your Email, add/remove POP3 accounts, setup auto responders and forwarders, add sub domains, create mysql databases, custom error pages, download backup, create ftp accounts, setup Interchange Shopping Cart and XMB Forum, access to web statistics and more! 24 HOUR ON-SITE TECH SUPPORT! TALK WITH A NETWORK PROFESSIONAL!